I’ve lived in New York City for nine years and I still feel as though I am always discovering new things. Besides the diversity of the people and the culture of the city, my favorite part about living here is the diversity of the food. Where else on earth can you find a Haitian, Oaxacan, Greek, Southern Italian, New Orleans-inspired, Japanese, Indian, French, Korean, Australian, Ethiopean and Burmese restaurant within three miles of each other? New York City, baby. Despite the fact that rent is so damn high (and you get little return for your money!) and space is too damn small, the diversity of it’s people and food makes me stay. It also makes me very afraid to leave one day for more space and a backyard. Before last year I had never heard of Burmese food, let alone knew much about the country of Burma. And I honestly can not remember how we stumbled upon Village Mingala, but once we did, we were HOOKED. The restaurant is not fancy and the prices are easy on your pocket. There is a slight cheesy, kitschiness about the place, but that’s kind of part of the charm. The ‘money tree’ is particularily intriguing. The small, cold and nasty bathroom is not. The best way I can describe Burmese cuisine is as a combination of Thai, Indian and Chinese flavors, but still with it’s own distinctive flavor. There are samosa-like apps (called samusa) and spring rolls on the menu, but the dipping sauce is distinctly different from Indian or Chinese sauces. These come with a tamarind dipping sauce (yum!). There are also beef and chicken satays and cold noodles with peanut sauce as well as other Thai-sounding dishes like Mango Salad, Red Curry and coconut rice. Some of my favorite things to eat at Village Mingala is their Green Tea Leaf Salad. 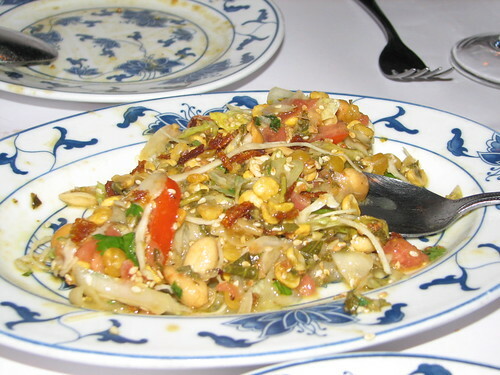 It is described on their menu as “Burmese green tea leaves mixed with sesame seeds, tomatoes, lettuce, cabbage, yellow beans, peanuts and lemon twists”. A very good description, but could leave someone feeling overwhelmed. The flavor is difficult to describe, but it is intoxicating. I think I could eat 5 of these salads in a row. They forget to list cilantro in their ingredients, but that really kicks it up and the yellow “beans” look like lentils or even soy nuts to me. They give it a great crunch. Other favorites of ours include the Beef Curry, big chunks of falling-apart beef in a thick and delicious brown gravy with potatoes. It is almost like a stew. The dumpling dishes are really good as well. They add steamed dumplings in a variety of sauces, with a side of rice. Also, we’ve eaten their Ginger Chicken and Mango Chicken, both delicious dishes in a sweet sauce. Finally, their noodles are phenomenal. I highly recommend the Rangoon Night Market Noodles. This dish is a large plate of egg noodles mixed with duck meat in a light garlic sauce. 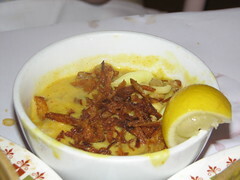 The dish is topped with the restaurant’s famous (maybe a Burmese specialty?) crispy onions. Ask for extra crispy onions on the side – they are SO good. The restaurant is definitely a bit light on the duck, but the noodles are still yummy. Speaking of the crispy onions, they came on top of a dish we tried during our last trip to Village Mingala, Coconut Chicken Noodles Broth (or Own-o Kow-swear). 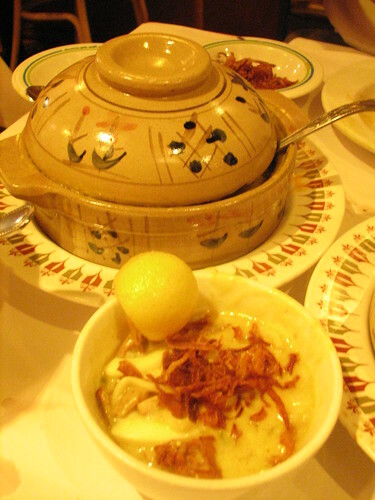 The menu describes it as “egg noodles in a creamy coconut with spiced chicken, lemon crispy onions and hard-boiled eggs”. I describe it as freaking yummy. Squeezing the extra lemon slices into the broth was key and, of course, adding extra crispy onions on top gave me the extra crunch I was looking for. Finally, Village Mingala’s Thousand Layered Breadis a buttery, carb-loving indulgence. Get a side of it to eat alone or dip into the Burmese dishes and sauces. Same with their side of coconut rice – it’s some of the sweetest, most perfect coconut rice I’ve tasted, with little bits of coconut and those damn delicious crispy onions they love to put on everything! If you happen to have a Burmese restaurant near you, please check it out. I just discovered that a new one opened within the year in Jackson Heights, Queens (called Burmese Cafe) and I’m hoping we can try it soon in order to compare. We’ll let you know if/when we do! From Brooklyn it’ll take us about an hour and a half to get there on the subway! Maybe we’ll bike it? Check out some of our other restaurant reviews, food commentary and recipes! ← Who Said There Wasn’t Room for Wonder Bread in Gourmet Cooking?